Our range of products include Glass Items such as Indian Glass Hookah, Glass Beads Hair Pin, Glass Bowl, Glass Candle Stand, Glass Photo Frame, Glass Apple Bowl and many more items. 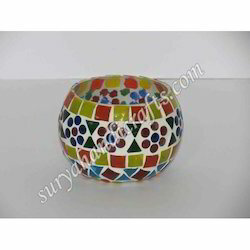 Glass Mosaic Work Tea light offered is beast to be used for table lamps or as hanging lights for adding rich color and vibrant looks to the surroundings. Featuring use of enchanting mosaic patterns, the use of bold colors in these tea lights also make them look exclusive. Some of its features include known for excellent quality and attractive finish, use of quality glass and enchanting mosaic patterns, smooth and shiny finish, speaks of high artistic tastes, adding a style quotient to the surroundings among others.